Works by Lejo - Johannes Lechner. "...In the early 1990s, Lejo began collecting photographs from estates, and copying excerpts onto large formats. The pictures’ titles are quotes of taxi passengers’ statements, which he gathered in his cab-driving days. 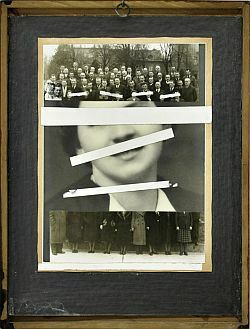 In 2007, he proceeded to produce collages from the photographs, some of which were over 100 years old. His compositions are highly detailed and captivating in their subtle approach, formal sophistication and discretely ironic humour." Hey ! Can you really do that to people's recollections? I wonder... but when I look on www.lejo.at, the pictures keep (or gain?) power; thanks for finding this!